Casper, WY (8/16/2018) - Can-Am Driven Powersports’ rider Don Higbee will join forces with Jose Torres and Adolfo Arellano looking for victory in the Vegas to Reno Best in the Desert Series race. The trio will be competing in the event, which is also the Pro ATV class season finale, riding a Can-Am Outlander. The 550-mile race is scheduled for August 17-18. Riding the only 4X4 Utility quad in the class, Higbee is currently third in points. Still within shooting distance of the championship, Higbee is gunning for a win in America’s longest desert race. 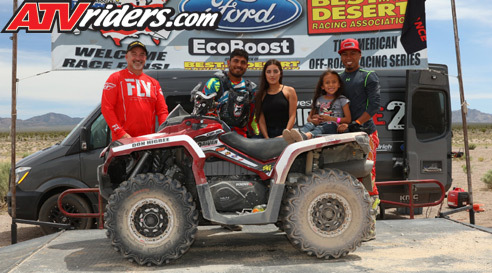 Arellano and Torres hail from Baja, Mexico and this marked their first full season on the Driven Powersports team. 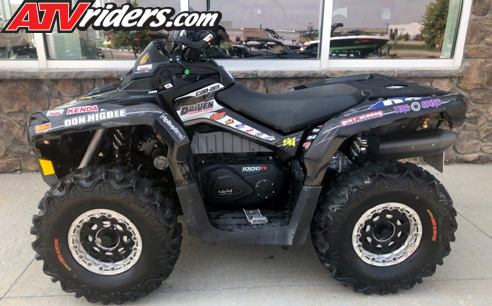 While many in the series run the sport quads, Higbee has been developing the Can-Am Outlander for the last two years with great success. Higbee believes in his proven quad. While there are always advantages and disadvantages in any racing ATV, Higbee thinks the combination of horsepower and durability of the Can-Am will play to his favor in the tough desert environment. Look for Higbee, Torres, and Arellano to finish the season with a win. ATVs will stage at 5:15 a.m. PDT on Friday, August 17 in Beatty, NV with quads starting approximately one hour later. The race will run through the day and into Saturday morning.